Most people turn to certified experts when installation of a split-type air conditioning system is in question. However, if you are experienced in electrical work and plumbing, you can handle the installation yourself, with the right instructions. 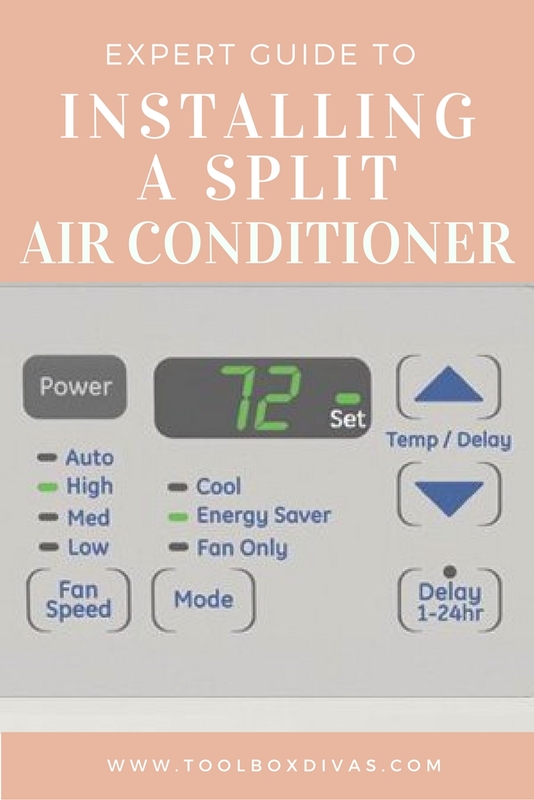 Ductless air conditioners and split systems on the market may differ slightly from manufacturer to manufacturer, but the whole process of installation is quite similar for all of them. Here’s our general guideline for installation of a typical split AC system. Start by choosing an unobstructed spot on the wall inside the house for the positioning of the indoor part of the unit. Pick a spot away from the heating devices, gas piping and walls exposed to direct sunlight. Indoor unit has to be placed at least 2.13m or about 7 feet above the ground and it should have 15 cm or 1/2 inch of free space around its sides. Also, ensure that the device is 1m or 3 1/4 feet away from the radio, phone and TV antennas and similar electrical apparatuses that may obstruct the work of an air conditioner. The wall should be sturdy enough, but using an additional metal or wooden support is still recommended. Before you put up a mounting plate, use level to make it perfectly horizontal. Drill the holes into the previously drawn out spots and fix the plate to the wall. Insert plastic anchors and secure the plate with tapping screws. Pinpoint the best spot for the piping hole that leads outside, based on the mounting bracket openings. The distance between the interior and exterior unit and the length of the pipe should be also taken into account. Holes should be approximately 7.5 cm in diameter. Bear in mind that the hole should have a downward slope to ensure the outside-oriented drainage. Finally, insert the flange. It’s highly important to check if the electrical wiring are in order before proceeding with setup, advise Sydney-based specialists for air conditioning installation. Lift the front panel of the unit and detach the cover. Check if the wires are connected to the screw terminals, and whether they match the diagram that came with the device. Run the piping from the indoor device towards the exterior unit via hole you drilled in the wall. Keep the bending at minimum for unobstructed performance. Cut a PVC pipe 6mm shorter than the distance between your exterior and interior wall surfaces. Put the pipe cap on the interior end of the piping and slide the pipe through the hole. Use the electrical tape to bind the power cables, copper pipes and drain pipe. Secure the pipe by tightening the connection. Run the bound cables and pipes through a hole in the wall. Finally, press the unit against the plate to mount it. Select a convenient spot for the placement of the outdoor unit. While it’s tremendously important to keep the interior unit from all heat sources, it’s a myth that exterior part of the device needs a shade or a cover for optimal operation. Still, you should definitely keep it far from high traffic and dusty areas, and provide at least 30 cm of free space around it. Mould or purchase a concrete pad on the ground and make it levelled. Place the rubber cushioning and an exterior device atop of it. The devices should be 3m away from antennas of any sort. Next, follow the electrical diagram and connect the wires accordingly. Lastly, fasten the cables with a clamp and secure the pipes’ flare nuts. Begin by freeing the air from the refrigerant circuit using a vacuum pump. Test all the joints and valves for leakage. Use the insulating tape and covering to wrap the piping joints and fix it to the wall with clamps. Round it off by sealing the hole in the wall with polyurethane foam. If you don’t feel confident about performing an installation of an AC unit yourself it is totally OK, leave it to the professionals. In fact, I’d rather you leave it to the professionals. You’ll at least be informed when obtaining quotes from installers. If you are familiar with electricity and piping, make use of our general installation instructions.